Madeleine King is on the water several times a week. Tanned and fit, she’ll step atop her board at 101 Surf Sports and soon disappear down the San Rafael Canal, paddling with gusto toward its mouth and the San Francisco Bay. However, the incremental march of sea-level rise is essentially invisible to King, just as it goes unnoticed by many residents, workers, and business owners along the 1.25-mile waterway’s densely developed shores. The creep of rising rides — a mere eight inches over the last century — is easy to miss, especially amid the canal’s daily and seasonal flows and the bustle of city life that, for the most part, has its back turned to the canal. Yet San Rafael and Marin County will soon be forced to face the canal head-on, as projections for sea-level rise place it at the center of an alarming scenario. By the middle of the century, Bay tides are expected to infiltrate well into the urban center of the county’s most populous city. Such tidal flooding could have drastic impacts on the predominantly Latino immigrant residents of the southern bank’s Canal neighborhood — one of Marin’s poorest and densest — and for the regional economy that depends on their contributions. Within the same timeframe, inland flooding via the canal could reach low-lying downtown San Rafael, a major freeway interchange, and the nearby Kerner business district. 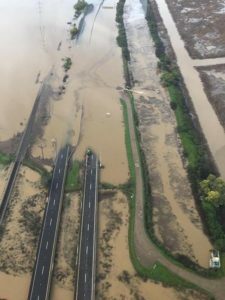 “You can take any lens and see that the canal is certainly a community that we should be ready to address flooding for,” says county planner Chris Choo, who spearheaded a recent assessment of Marin County lands and facilities vulnerable to sea-level rise in the coming decades. On one side of the San Rafael Canal stand multi-unit, multi-family apartment buildings, on the opposite private homes with docks for yachts. Both are too close for comfort to the advancing tides and storm surges. Photos: Nate Seltenrich and Michael Hunter Adamson. 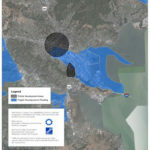 Water levels in the Bay could rise another eight inches by 2035 or so, 16 inches by 2050, and 55 inches by 2100, according to the Bay’s government watchdog BCDC (Bay Conservation and Development Commission). San Rafael’s downtown and canal-fronting neighborhoods are among those most at risk. 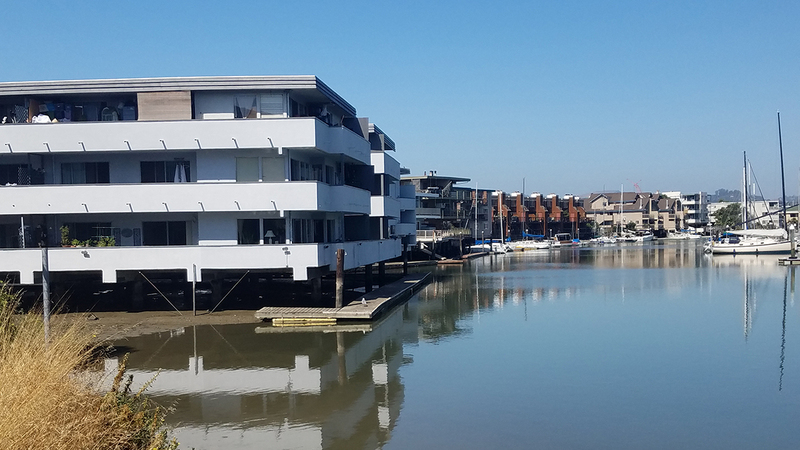 Little stands between the water and a wide variety of properties lining both sides of the canal: warehouses, yacht harbors, large apartment buildings, and single-family homes with lush lawns leading to private docks. Many types of buildings along the canal maybe vulnerable to both storm surge, sea level rise and liquefaction from earthquakes. Unlike most narrow channels bordering San Francisco Bay, the canal, also known as San Rafael Creek, is maintained by the federal government. More than a dozen times over the last century, the U.S. Army Corps of Engineers has paid to remove Bay mud from the bottom of the canal (a process known as dredging) to keep the waterway deep enough for larger boats. The most recent dredge in 2011, however, was incomplete, and the Corps says it lacks funding to return any time soon. Some residents and city officials now worry that an increasingly shallow canal could exacerbate flood risk during storms. On the north bank, where most of the pricier waterfront residences are located, the topography climbs quickly, confining risk to the shoreline environment. But the situation immediately across the water is just the opposite, with housing complexes built atop filled-in former wetlands and mudflats. In many cases elevations actually drop with distance from the current canal shore. Runoff from storms accumulates in this basin and is pumped away from homes and businesses every winter. Shore Up Marin activist Douglas Mundo and wetland scientist and Marin resident Stuart Siegel consider options for expanding the canal zone’s natural buffers against flooding — the spongy marshes and vegetation that can slow waves and absorb water. Very little marsh currently thrives in the canal zone. Even now, the entirety of the Canal neighborhood and adjacent developments, business districts, and light-industrial areas are deemed in danger by the federal government. The Federal Emergency Management Authority (FEMA) has designated the area a 100-year flood zone, meaning it calculates the area’s risk of flooding as roughly 1 percent in any given year. In harm’s way are critical pieces of local and regional infrastructure including a water-treatment plant, a municipal-waste transfer station, countless transit routes and stops (including the new Sonoma-Marin Area Rapid Transit station), and critical spans of Interstate 580 and Highway 101. 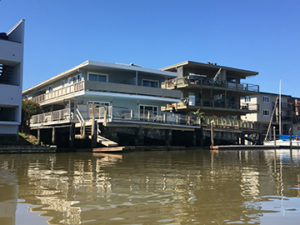 Marin’s shores host many houseboats and other fragile shoreline residences. Situated at the heart of the flood zone, the Canal district would begin taking on salt water first. “We have the lowest-income neighborhood in the county smack-dab in the middle of this,” says Paul Jensen, community development director for the city of San Rafael. With ten inches of sea-level rise, according to the county’s recent report, approximately 400 buildings, including many multistory apartment complexes with dozens of units each, could be partially submerged on a daily basis. During big storms, the water’s reach extends considerably further. Strong winds can blow surface water far past the reach of the highest tides—a phenomenon called storm surge. In the near future, a large storm surge could be all it takes to temporarily flood the remainder of the Canal neighborhood and begin spilling into adjoining areas, affecting many hundreds more buildings. Demographically, the community is already among the county’s most disadvantaged. Its population is about 70 percent Latino, with Spanish or other native languages spoken at home, according to the county. Compared to other Marin communities likely to be affected by sea-level rise, Canal residents are younger, have larger families, earn less money, and are more likely to be “house-poor,” spending greater than 30 percent of their income on housing. They also own fewer cars and rely more heavily on public transit. 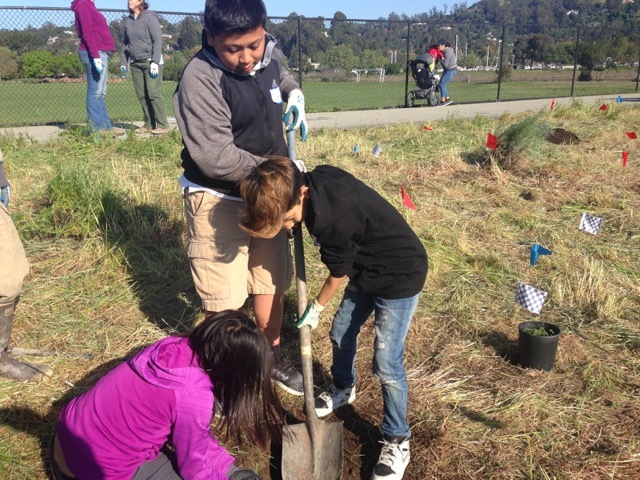 Kids from Bahia Vista School in San Rafael plant trees and learn about environmental stewardship at Pickleweed Park on the Canal. Photo courtesy teacher Emily Koller. Yet awareness of sea-level rise and flood risk is still low, says community organizer Douglas Mundo. That’s partly because it’s far from the only threat many residents face. Other concerns are more immediate, such as those related to immigration, employment, and housing. Through a group called ShoreUp Marin, Mundo began hosting training sessions and educational workshops, and earlier this year he helped release the community’s first-ever emergency-preparedness plan. But maintaining awareness remains a challenge, Mundo says. A recent kayak trip he led with about 25 local youth, down the canal to tiny Tiscornia Marsh on the bay’s edge, was for many their first time out on the water. It was also their first introduction to what sea-level rise meant for their neighborhood and the already-disappearing marsh on its fringe. 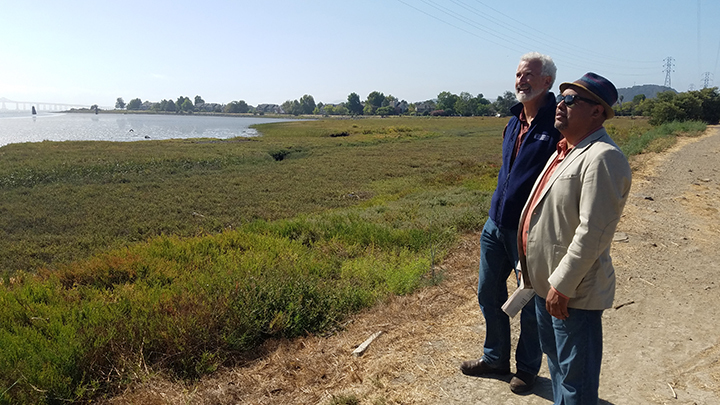 Together with the Marin Audubon Society, which owns the land, Mundo wants to help restore the marsh to give the neighborhood a stronger buffer against tides and storm surges, and to provide a model for the rest of low-lying San Rafael. WHAT WOULD YOU SAVE FROM A FLOOD? 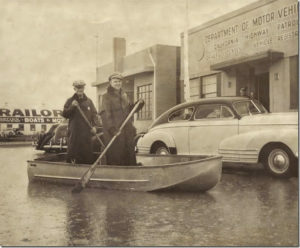 Connecting future sea-level rise projections to parents’ or neighbors’ memories of the floods of 1982 and 1998 — or, even more concretely, to the photographs of flooding that still hang on the walls of some local businesses — may be particularly powerful, Mundo suggests. Few longtime canal residents have known the ups and downs of waterfront living quite like John Moore. Now 80 years old, he says he’s lived on the canal since World War II. His current home, across the water from the Canal district on Mooring Road, was built on fill in the late-1930s and has been contending with high waters ever since. 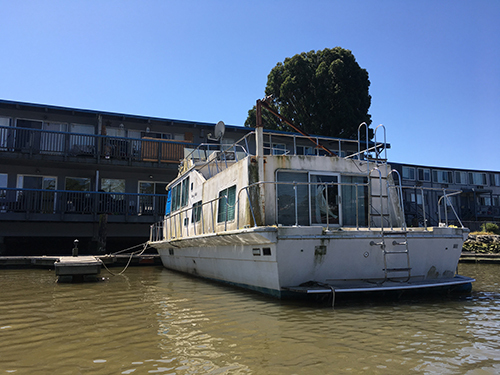 It was raised on stilts in the mid-Sixties, after his parents moved in and promptly got flooded, and has stayed dry since. But the same can’t be said for the street and driveway, which frequently take on water, including this past winter. Learned some things. Good research, Nate, and of course well-written.